ah! What a dream, to live in that! I have begun the Fusion merino. It’s a good thing I have as much practice under my belt as I do by now, because this is a whole new level. For practice purposes, I weighed out 5 gram chunks to spin and ply. Merino must be spun at a higher ratio (higher twist) than the other wools I’ve been working with, and the fiber length is shorter. This means things happen a whole lot faster. Things that worked OK on the Falklands, for example, got me in trouble with this wool. For instance, I want to keep the twist out of the fiber source and control it by the pinch. With the merino, this means I have to be vigilant about how I draft. Several times today I let it get away from me, and found myself chasing the twist down the fiber instead of feeding the draft into the twist. That meant stop, back up a little, and get myself back where I wanted to be. In general, I am having to SLOW DOWN so I can keep up with this new experience. LATER: I couldn’t resist. 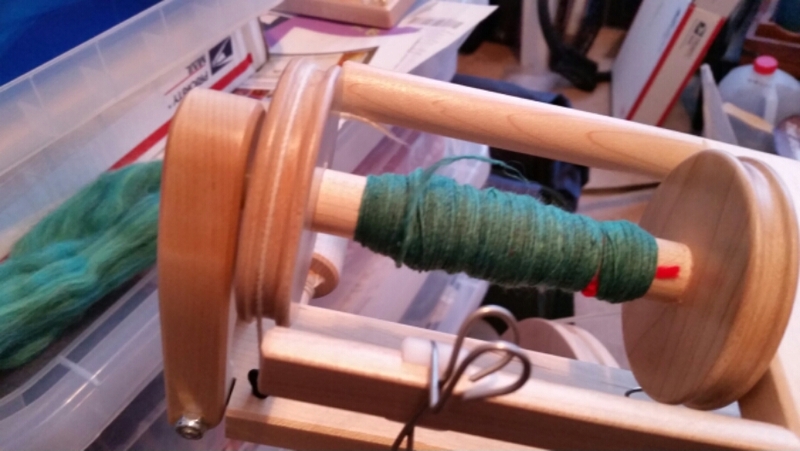 I returned to my wheel and spun a second 5 grams, then plied them together. That way I can check the result and adjust if I need to for the next round. And oh, it’s beautiful. I’m going now to put it on the niddy noddy. This entry was posted in Art, Fiber and tagged Arts, beginnings, creativity, Honesty, Merino, Spinning. Bookmark the permalink.